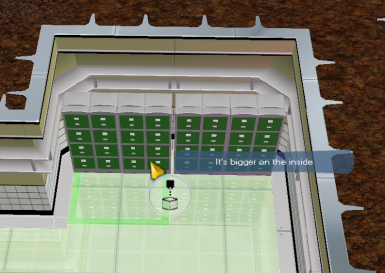 A Doctor has developed a more advanced container system using inverese space and wibbly wobbly physics, and why did he do this? To preserve some vast collection plants in case of a natural disaster that ravages the earth... talk about boring... I am sure it's better in our hands, will at least save some minion real estate on lockers. This mod is to set an example of how to create custom objects and make quests around them. The mod is made up of 2 sets of files, Custom files and Edited files. The Custom files are the files that contain the main data for the objects in question, you can make these from scratch with no prior editing of files, I would suggest referring to my or other mods for these. .tga (It's a texture file, if you make a custom texture, you can use the .COL file to reference this file and swap the skin from the original .GR2 file (the model file format for EG, don't even ask about custom models, more or less impossible currently due to EG is structured)). (This references the stats of your Object, so stats and the reference number like before.